The original beast! The ASUS Chromebook C200 is a powerhouse when it comes to what you get for the price! As you’ve seen in the specs, the C200MA 2GB RAM packs a massive punch for its price. It’s all you’ll ever need to browse the net, watch only videos and create endless docs for work or play. It will quickly become your most used laptop thanks to its speed and versatility. With its extreme battery longevity and super quick recharge capabilities, it will surely handle any type of work day. Browse the specs to learn more before making your purchase. It’s everything you need in a laptop at a fraction of the price of MacBook. Surf the net, watch YouTube, create documents via Google Drive and much much more. Reliable, Fast a sleek! You will fall in love with it. 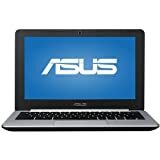 This model comes with a 2.16 GHz dual core Intel processor and has an 11.6″ screen. With a long lasting battery (average 10 hours), the operating system is reliable, fast and secure! Access the net easily with 802.11 A/C WiFi. Other features: 1 SD Card Slot, Bluetooth 4.0, 3.5 mm Jack, web Camera and more!